Although new law suits have been filed claiming Aereo is retransmitting copyright material the company is now rapidly expanding to multiple cities. The company announced a new pricing structure offering two plans: for 8 dollar an user can access all available channels and record 20 hours per week, for 12 dollar users can store an extra 40 hour totalling 60 hour of cloud DVR recordings. The strength of the service is its relatively cheap offering of popular channels (considering you need an internet connection), clear UI and easy access of both live and recorded content. 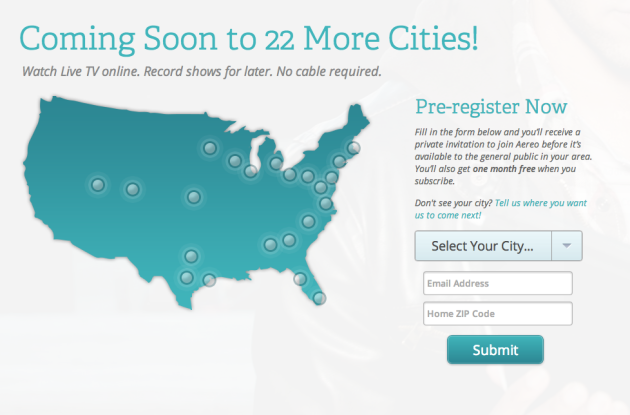 Aereo is using the attention of the court ruling and its praise for its simple service to expand rapidly, allowing users to sign up and pre-register for 22 more cities that are coming soon. After signing up users get notified when the service launches in their area and will receive one month for free. Aereo is planning to launch it service in Minneapolis, Salt Lake City, Denver, Kansas City, Dallas, Austin, Houston, Madison, Chicago, Detroit, Cleveland, Pittsburgh, Boston, Providence, Philadelphia, Baltimore, Washington DC, Raleigh-Durham, Atlanta, Birmingham, Tampa, and Miami.